In the United States, growing segments of the population are undergoing a period of profound politicization and polarization. Political elites are struggling to maintain control as increasing numbers of people seek out alternatives on the left and the right. In the wake of the 2016 presidential election, political organizations on the left have grown significantly, most notably expressed in the explosive growth of the Democratic Socialists of America (DSA). Meanwhile, the Trump administration has joined other far-right governments emerging around the globe, emboldening fascist forces in the streets. These developments have sparked widespread debate on the nature of socialism and its distinct flavors within and outside the US. Among the various branches within the broad socialist tradition, libertarian socialism is possibly the least understood. For many people in the US, libertarian socialism sounds like a contradiction in terms. The corrosive influence of the Cold War has distorted our understanding of socialism, while the explicit hijacking of the term “libertarian” by right-wing forces has stripped it of its roots within the socialist-communist camp. Outside the exceptional case of the US, libertarianism is widely understood to be synonymous with anarchism or anti-state socialism. In Latin America in particular, libertarian socialists have played a critical role in popular struggles across the region, from mass student movements to the recent wave of feminist struggles. To expand and enrich the current debate on socialism in the US, we spoke with several militants from political organizations in the tradition of libertarian socialism in Brazil, Argentina, and Chile, exploring the history, theory and practice of libertarian socialism. Due to the length of responses, we will be publishing this roundtable interview in installments (Part 1 here, in Spanish and in English). For Part 2, we spoke with militants in Acción Socialista Libertaria / Libertarian Socialist Action from Argentina. We also wanted to thank everyone who contributed to our Building Bridges of International Solidarity Fundraiser which made this interview series possible. Enrique Guerrero-López (EGL): Can you introduce yourself, tell us the name of your organization, and give a short summary of its origins and your main work? 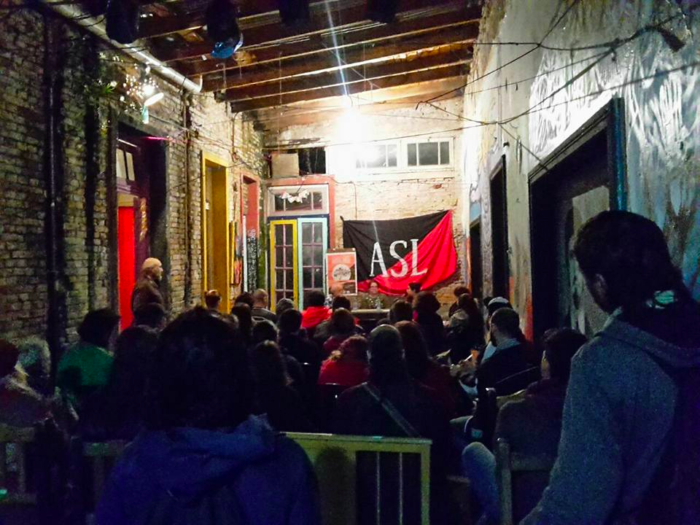 ASL: We are ASL (Acción Socialista Libertaria/Libertarian Socialist Action). We have militant nuclei in La Plata (Buenos Aires), Greater Buenos Aires Sur, Greater Buenos Aires West, Autonomous City of Buenos Aires, and Cordoba. A nucleus of comrades with militancy in the Colectivo Desde el Pié/From the Foot Collective (a radical interdisciplinary research collective based in the physical and natural sciences). Others who worked in the Red Libertario (Libertarian Network) in Buenos Aires as well as in feminist spaces. With this primary nucleus, we combined the different experiences and trajectories to build common agreements and politics. We have militants active in various popular struggles— in territorial, environmental, feminist, union, student, and human rights— in addition to developing propaganda, dissemination, and training activities. EGL: What are the roots of libertarian socialism in South America? ASL: In South America, anarchism established itself as a current in the labor and popular movements early and solidly. Especially in the large cities with access to the ports, the great arrival of European immigrants brought in their saddlebags an experience of organization and struggle. They arrived as protagonists of the revolts of 1848, persecuted communards of Paris, and members of sections of the First International. In Argentina, the arrival of anarchist militancy is particularly important. We already see around 1858 the formation of the first mutual aid societies and, by the end of 1870, the first unions, newspapers, and libertarian groups were established. They found a very unequal, unjust, and conflict-ridden society. “Success,” then, was not so much based on the capacity of those “coming,” but on what was already here. A libertarian socialist current would become, in Argentina, broadly majoritarian, in the left and in the bosom of the labor movement until 1930, with emblematic organizations such as FORA (Federación Obrera Regional Argentina/Federation of Argentine Regional Workers). Until then, anarchist and worker militancy were fused in the same organizations. Repression and economic changes on the one hand— and the lack of actual political-theoretical updating and the appearance of new political actors (the Communist Party, Peronism, etc.) on the other— led libertarian socialism to a crisis of great proportions. In this context, specifically political organizations emerge within anarchism. The ALA (Alianza Libertaria Argentina) between 1923 and 1932; the Spartacus Labor Alliance between 1935 and 1940; the FACA/FLA (Anarcho-Communist Federation of Argentina) between 1932 and the 1950s; and then, under the name of the Libertarian Federation of Argentina, surviving to the present; and the Libertarian Resistance between 1969 and 1978 are examples that we see as antecedents in our country. They theorized as political organizations with different spaces of social insertion— worker, student, peasant, and neighborhood— assuming the loss of libertarian hegemony from the past and trying to adjust their tactics and their propaganda to re-develop a solid libertarian current within the field of popular struggle. In that sense, we take three central and transversal axes of our current as distinctive elements: classist, feminist, and libertarian practice. EGL: What differentiates libertarian socialism from other branches of socialism? ASL: We like to define ourselves as part of the revolutionary left, as a libertarian current within it with its particularities and similarities. Our hypothesis on the development of the experience of libertarian socialism in the field of popular struggle is to be able to construct a mass political alternative that challenges the delegative, authoritarian, vertical, and patriarchal representative forms. In that sense, we take three central and transversal4 axes of our current as distinctive elements: classist5, feminist, and libertarian practice. Our base-building tries to develop disruptive and democratic elements, tries to prioritize consciousness instead of disputes over the mere formal direction of popular organizations. Another important element is the pedagogical notion of direct action on the path of building a Direct Power of the People, enhancing the political practice of our class. A third vector is to develop an integral anti-patriarchal politics that cuts across all the experiences of the masses, beyond the specific tasks of the women’s and queer movement itself— the struggle for legal abortion, self-defense against femicide, etc. In addition, the questioning of the notion of bourgeois democracy as a space for resolution or improvement of the living conditions of our class seems central to us— and instead trying to develop experiences of direct, democratic, and bottom-up management. In that sense, we try to develop a questioning of the notions of the State as a site of struggle and of the electoral route as a “unique” space of specifically political action. EGL: What role does political organization play within social movements and how does that fit into your vision of libertarian socialist politics? ASL: There are different visions on the left regarding the intervention of political organizations in social movements. Even within militant anarchism (setting aside individualists, or those who espouse more “countercultural” aspects), we could say that there are at least three positions on the issue: those who see the “libertarian political group” as a space solely for propaganda or diffusion and where agreements are lax and there is almost no intervention in social movements; those who do not see the need to develop a strictly political space and combine common political-social aspects in grassroots militancy; and, finally, a current like ours that sees dual organizationalism as central: the political and the social. Our vision of the Libertarian Political Organization tries to take lessons from the historical experiences that we pointed out previously, also incorporating the experience of diverse organizations within so-called “Latin American especifismo,” such as the FAU (Uruguayan Anarchist Federation) since the ‘60s or the OSL (Socialist Organization Libertaria) in Argentina in the ‘90s and 2000s. Also, the experience of the [platformist] Russian exiles of Dielo Truda, with Makhno and Archinoff as visible heads, who proposed a General Union of the Anarchists and an Organizational Platform. - Coordination of popular militancy as a pedagogical and dynamic space of our popular insertion— advocating political independence of grassroots organizations, but working to enhance all that is classist, feminist, and libertarian in its midst. Promoting the defense of popular rights and freedoms and, at the same time, prefiguring in concrete and tangible practices the society for which we are fighting. Defining common tactics and strategies of the different militancies and coordinating our militancy in the sense of developing People’s Direct Power as a tool of rupture with the current capitalist, patriarchal, and state order. - Development of libertarian militants: We understand this as something dynamic and with diverse angles— political practice with certain values ​​and feelings; theoretical training through debates, readings, and workshops; the range of our responsibilities in political and social organizations; debates with other political currents; the production of propaganda and the dissemination of materials, etc. - Strategic debate of our specific tasks: We don’t see this as separate from the characteristic levels of development within the social organizations where we participate or where we build. Objectives such as the self-activity of the masses, self-government of the workers, or class independence are not formal or rhetorical questions. We must link them to the work of social movements today. In that sense, we see Political Organization as a push, an encouragement, a support for the autonomous development of popular movements— with more responsibilities and no privileges— and acting, in certain moments of withdrawal, as a rearguard that safeguards the objectives of radical transformation. EGL: In the US, there is widespread debate over electoral politics on the left. How do libertarian socialists in South America relate to electoral politics? ASL: Historically, the most important organizations and political currents of the left in Argentina have participated electorally, from the old Socialist Party since the end of the 19th century to the Communist Party since the ‘30s of the last century. Perhaps the exception has been the PRT (Workers’ Revolutionary Party) in the ‘70s, an important formation from Trotskyism and Guevarism that developed the armed struggle and did not participate electorally in its boom moment. Anarchism and its organizations in Argentina have never developed sectors that have participated electorally in bourgeois democracy, although, in recent years, there has been a paradox with respect to our framework of alliances. Sectors with which we share social militancy, tactical agreements of intervention, or even areas of political coordination have progressively chosen to start participating in different electoral campaigns. These include some in the aforementioned FIT and others in center-left or allied formations of sectors of Kirchnerism. We even find bands of organizations that adopt these tactics with sustained sympathies toward our current or even coming from anarchism. This forced us to debate with them, more from the tactical and political conjuncture, without falling into closed positions and abstract abstentionism. We can see three central debates here. On the one hand, the electoral issue is seen as a possible “leap to politics,” an outgrowth and a response to overcome corporatism and trade unionism from social militancy. Given this, our position is that the need for that “leap” is correct, but that circumscribing political intervention to electoral intervention discounts politics, puts it in the enemy’s arena, with the tactics of the class enemy and its instruments. We continue to maintain that bourgeois democracy is the dictatorship of the bourgeoisie, an instrument of consensus for capitalist and patriarchal exploitation. We are interested in developing political campaigns for local and national intervention, popular proposals, etc., even with the presentation of bills, as was the case of the Law of Voluntary Interruption of Pregnancy, where broad sectors developed from below, and democratically and nationally, a great mass campaign. The other aspect is our questioning of bourgeois democracy and the need to articulate an Extra-Parliamentary Political Alternative that serves as a reference point for social movements in struggle, the women’s movement and dissidence, the classist currents among the workers’ and students’ movement, etc., and a political coordination with an agenda of intervention within different currents of the revolutionary, libertarian, and autonomous left. 6 We cannot develop a radical and political critique of the instruments of consensus of the bourgeoisie if we accept their game outright. Finally, our tactical criticism of electoral intervention is analyzed in light of the political, militant, and economic resources that are destined for electoral campaigns by sister organizations. What will result, sooner rather than later, will be carelessness or an instrumentalist appreciation of grassroots militancy and social organization — a conservativization of bold or disruptive methods of political intervention, especially by those that use direct action as a method of intervention. EGL: Recently there’s been a wave of feminist struggles in South America, particularly in Argentina and Chile, including school occupations and mass demonstrations for reproductive rights. How have libertarian socialists participated in these struggles and how does feminism inform your overall theory and practice? TASL: It’s interesting to trace the historical background of the feminist movement in the region to analyze the fundamental libertarian influence, from the experience of the newspaper La voz de la Mujer, initiated by the anarcha-feminist Virginia Bolten, to the formation of Free Women in the ‘80s in Buenos Aires or the first “Women’s Commissions” with a strong intervention by our anarchist comrades in the piqueteros movements in the late ‘90s to the present. Throughout this stage we have actively participated, even with our modest forces. We have done it in the day-to-day and, of course, in the streets, in those multitudinous and historic days of struggle: in the demonstrations of Ni Una Menos, and in the work stoppages of women, on March 8th and November 25th, as well as in the days of encampment and direct action in the National Congress to approve the law for voluntary interruption of pregnancy. But also, daily intervening in several specific organizations: in pre- and post-abortion popular councils, in the National Campaign against Violence against Women; in the Campaign for the Right to Legal, Safe and Free Abortion; in the National Meetings of Women, now renamed Plurinational Encounter of Women, Lesbians, Transvestites, and Trans [People]; in specific feminist organizations and in the various commissions and areas of popular organizations where we are active. From the point of particular political intervention, we’re initiating a Libertarian Feminist Assembly together with comrades from other libertarian organizations and anarchist militants in unions, social movements, and feminist struggles, as well as intellectuals and students. The idea is to think about our practice, to come to an agreement on transversal policies of intervention, and to draw up a line to act from our point of view in the current conjuncture. In that sense, as ASL, we have edited a document to contribute to a Strategic Definition of Libertarian Feminism. In it, we characterize the women’s movement and dissidence as clearly the most politically dynamic sector of the working class these days, as it questions not only the patriarchal and capitalist oppressions within personal and daily relationships, but also the institutions of the State, and even within social organizations. EGL: In South America, many libertarian socialists have put forward a theory and practice of building “popular power.” What is popular power and what forms has it taken in practice? ASL: Like the majority of left militants with social insertion in Latin America, libertarian socialism also deals with the construction of Popular Power. We have tried to polemicize the term in a booklet that tries to systematize our positions on the matter since, within that wide concept, you can see traces of the most varied currents and politics. Some of them enrich and others, in our humble understanding, confuse. For ASL, the construction of Popular Power is a complex, permanent, and contested strategy. Given the multiplicity of meanings that have been given, for a while now, we began to define this strategy as “Direct Power of the People,” since it seems to us that it is much closer to a libertarian vision of its construction. We say that the construction of Direct Power of the People (DPP) is complex, because it tries to find the tools and seeds of liberating practices in the objective conditions in which we develop our militancy; permanent, because we don’t think of development in stagnant stages or that every political moment is the same for the development of the DPP; and contested, because it tries to fight against the vertical, patriarchal, and liberal senses in political and mass construction. We think that the development of the DPP must go hand-in-hand with experience, with a reading of the moment and of the forces that we, as a class, have. Disagreeing as much with the “escape from power” as with the “taking of power,” we consider the DPP strategy as building a power from the oppressed sectors and from the working people with which to materially prefigure that libertarian socialism, from below and without the State or Patriarchy, that we want to build. In the current conjuncture throughout the region, we are going through a stage of DPP that relies more on Resistance and Organization than on significant advances. The need to defend the historical gains of our class and the movement of women and sexual dissidents becomes central at this stage. Therefore, we promote unitary organization from below, in the trade unions and political-union organizations that the masses recognize as legitimate for their defense: unions, social and protest organizations, student centers, neighborhood associations, and feminist associations and councils. On the other hand, the debate about the questioning of bourgeois democracy as the “natural” political space for our interventions seems central to us; trying to develop and promote local instances of democracy and direct action: campaigns, multisectoral coordinators, breaking with corporatism, etc. Here, we see experimentation in the management of resources wrested from the struggle in the territorial sphere as fundamental, the possibility of anti-bureaucratic efforts in certain Delegate Bodies or internal union boards to defend conquests, and class solidarity. Believing in the practice of our forces, we are demonstrating that no crisis can be resolved by those who generated it: the State and the bosses. Special thanks to Mackenzie Rae who provided copy editing for this article. The first part in this series, “Libertarian Socialism in South America: A Roundtable Interview, Part I, Chile,” is here. Part III is coming soon. 2. The piquetera or “picketers” movement is a movement of the unemployed in Argentina that emerged out of the economic crisis of the 1990s and 2000s and often uses road and highway blockades to press their demands. The MTD (Movimiento de Trabajadores Desocupados/Movement of Unemployed Workers) is the organized form of the piquetera movement while FOL (Frente de Organizaciónes en Lucha/Front of Organizations in Struggle) is a coalition of neighborhood based piquetera groups in Buenos Aires that anarchist political forces are active within. 3. Popular insertion, equivalent to the term “social insertion,” refers to a strategic and organized presence by anarchists within social movements. 6. Romina Akemi and Bree Busk have defined “sexual dissidence” in Breaking the Waves: Challenging the Liberal Tendency within Anarchist Feminism and A Feminist Movement to End Capitalism, Pt. 1. We continue to maintain that bourgeois democracy is the dictatorship of the bourgeoisie... We cannot develop a radical and political critique of the instruments of consensus of the bourgeoisie if we accept their game outright.